The search for the perfect Valentine might be tricky business, but the search for the perfect Valentines gifts need not be! Whether you're looking to woo someone new or keen to rekindle romance with the love of your life, these ideas will stop them in their tracks. You'll find flowers that never die, love stories to decorate heart and home, and funky art pieces to enrich their soul. Do Saint Valentine proud this year. They'll love you for it. A gift from the heart, this stunning modish heart print is one of those Valentines Day gift ideas that's both romantic and affordable. The wonderful thing about this modish canvas collage is the sheer number of photos you can include - at the same price as a single print. Browse Facebook, Instagram and your digital camera for memories of the great moments and experiences you've enjoyed together over the course of your relationship. The heart shape makes it a true Valentine's Day gift, but one that can be admired every other day of the year. Who said romance couldn't be edgy? 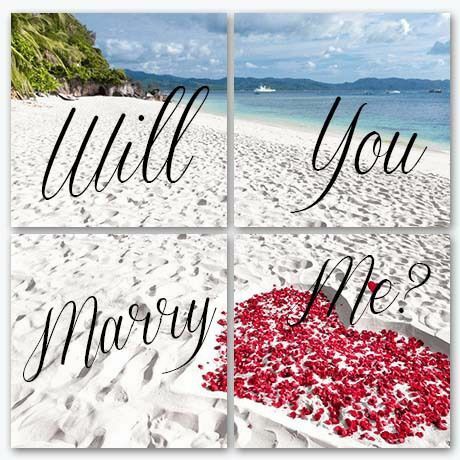 This uber arty split image canvas will be treasured forever, but first you have to pop the question. If this won't convince her to marry you, nothing will! Reveal the question one by one, as you present a different canvas panel to her. You don't even have to say a word. Just watch her reaction. The design of this canvas is pretty tricky. If you want to split an image like this beach photo across all four panels, you will need to create one single image with the text carefully spaced across each of the four corners. Alternatively, you could instead design a wall display and print four different images on each panel. Either way, I am sure creating the image in Canva and uploading it into our CanvasApp will be the easy bit. Waiting for her answer will be much harder. Is she always disappointed when the flowers you buy her wither and die? This here gift will live on, like your love. Does she have a favorite flower? Or a favorite color? 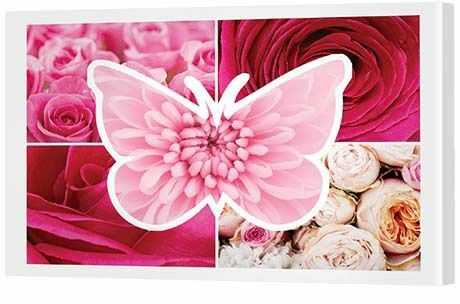 This collage gives you the opportunity to print to canvas five floral frames of fabulousness. Here we've chosen the color pink, but you can choose any color she likes! Simply visit the Flora Art collection in our Canvas Art library and find some flowers to suit. Just be sure to buy her some fresh flowers too, OK? Take that friendship to the next level by giving a dozen roses without actually giving a dozen roses. Have you seen how much a dozen roses costs? If you're not yet sure if her heart is yours, this is the gift that will woo her without scaring her away. This split image canvas is the epitome of beautiful. Watch her eyes light up when she opens this colorful, arty surprise. This nine-panel canvas may look tricky to create, but it's actually really easy. 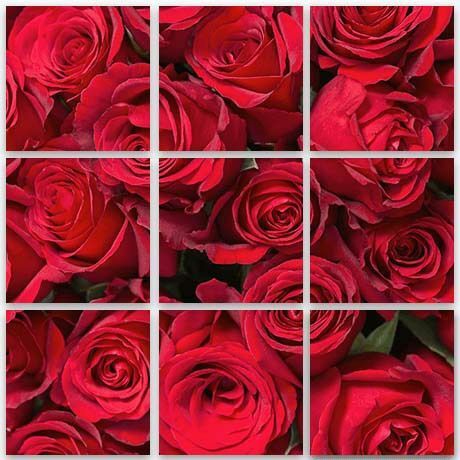 Search 'red roses' in our Canvas Art library and you'll be prompted to start creating your print. Add a single red rose and a box of chocolates and she will surely become your Valentine. At least we hope so! If not, it simply wasn't meant to be. A Valentines present for him need no longer be tricky, with a classy 'Love' themed collage he will proudly hang in his office. You've raised a beautiful family and are still as rock solid as the first day you met. While so much of this day is geared towards flowers and chocolates for her, the thing to keep in mind is that he needs to feel loved as well. 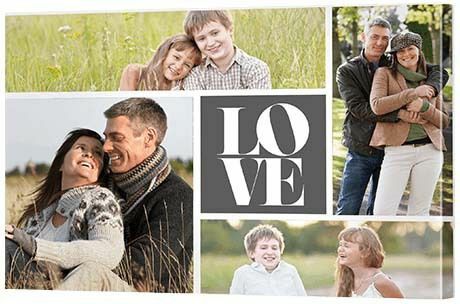 This 'Love' themed collage, with four photo panels, means you can gather photos of you both together and with the kids - and truly show how much you value his love of family and commitment to you. You're young. You're beautiful. You're in love. Capture that pure passion in stylish glass for a fresh, fun feel. Your love is new, but it's true. If you're buying this print for your partner, you'll be hard-pressed to give it away, so we actually suggest buying two! 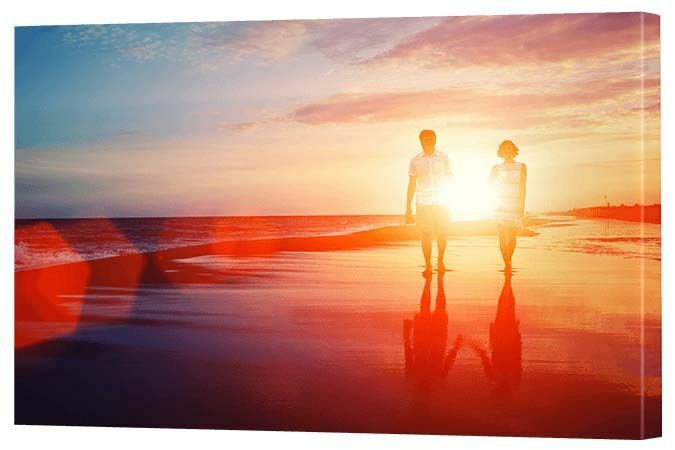 Find the classiest, happiest photos of the two of you together (no late night drunken shenannigans or couch selfies) then print it onto a single acrylic glass canvas. It doesn't matter how big or small you choose to print this, you will both delight in it - particularly when you're away from each other. Valentines gift ideas don't have to be boring. With some funky canvas art, you can make someone's day. Sure, you can gift this print to your lover, but this one is funky enough to be gifted far and wide. Are you a Mom wanting to make sure her daughter is not forgotten? Or someone who knows her single friend deserves love in her life? 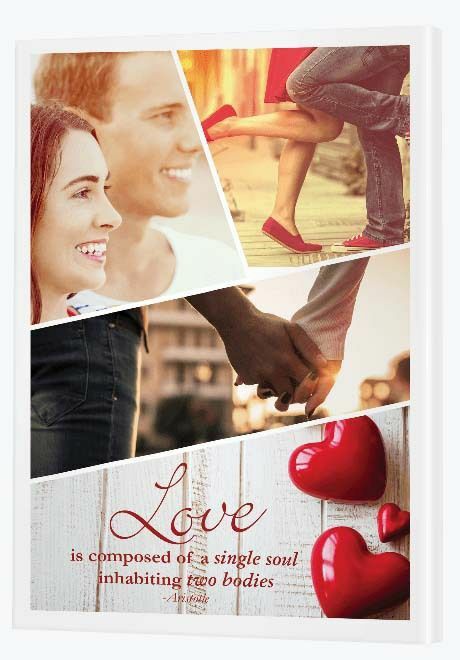 This gift celebrates love in all its forms - family love, plutonic love and, if you're lucky enough to have found it, romantic love. 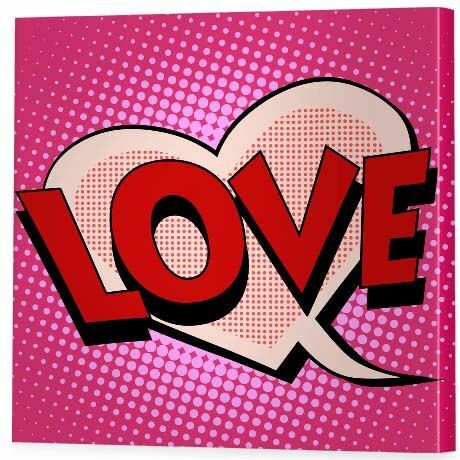 To create this canvas gift, visit our Canvas Art library and search 'love' or 'retro'. 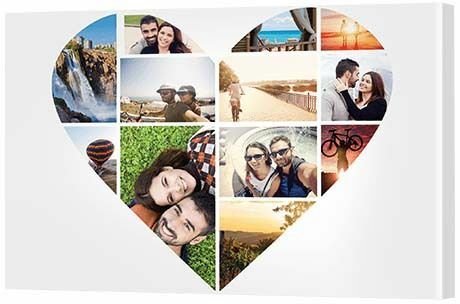 With over 25 million images, you're bound to find something to suit that special person in your life. Come on Casanova, Valentines day ideas for her need not elude you any longer, with this gorgeous collage from the heart. So many Valentines' ideas have been done to death, haven't they? Not this one. This personalized modish collage, with three photos and a poem, is completely unique. Source some stunning, high romance photography of the two of you together then find a poem that speaks from your heart to hers. You can write something original or go to Google and find something there. To design the poetry frame, go to Canva and use a landscape design. Choose a background image and then add the text, making sure not to include text in the top left part of the landscape shape. Download the image as a 'PDF: To Print' then save it as a JPEG ready to place on your modish collage. In the hustle and bustle of everyday life, it's easy to forget what's important. Valentine's Day is a time to remember your love. So much has happened since your wedding day. Work is all-consuming and the kids are now your whole world with evenings and weekends spent giving, giving, giving. 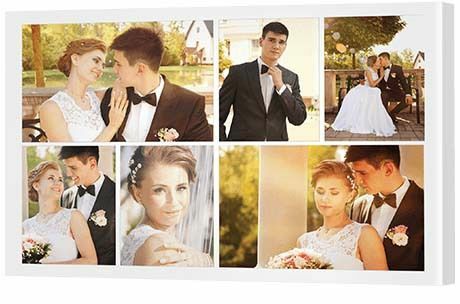 Why not escape the family for a night, take your loved one out to dinner and surprise him or her with your old wedding photos printed onto a beautiful new traditional style collage? Your marriage is strong, but it deserves to be celebrated. If you find most Valentines Day presents too traditional, surprise your loved one with funky art. Valentine's Day gifts can be offbeat and exciting; you just have to think outside the heart. 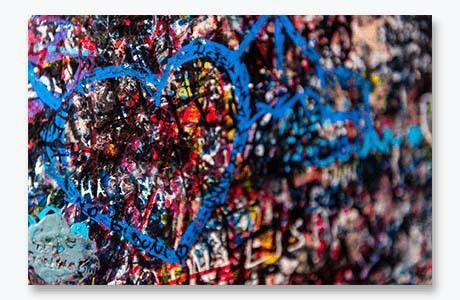 Search for 'urban heart' in our Canvas Art library and you'll be bombarded with a multitude of alternatives to the traditional red heart of Saint Valentine. This urban art print has oodles of youthful appeal as does a fantastic image of a pair of Converse sneakers with the laces forming a heart shape. In fact, the mind boggles at the options. Rejoice in the pleasure, bliss and luxury of holidays away - because that's what life and love is all about. Never forget the good times you've shared with a glass wall display of your favorite honeymoon or holiday snaps. Reflect on the ease of those great times gone by and inspire yourself to plan another getaway. When times are tough, it's often handy to take a moment to look on the wonders of yesterday and rejoice in your future together, forever. With this gorgeous glass display, the honeymoon need never be over. Gather up the good times and hold them in your heart and in your home. Printing on acrylic glass gives photos a clear, fresh feel, making this gift a wonderfully practical addition to a kitchen or living area. Love is definitely in the air.